You’ve been diligently coming to the gym for a few months, and man, you love this CrossFit stuff. Your double unders have gone from non-existent, to spotty, to smooth as butter. Your hands bare the calluses of hard work, your feet bare the sneakers of well-crafted marketing campaigns. Maybe you aren’t going to the Games (this year!) but you will do anything to get better, so you start looking around the gym, and you notice something. It looks like all of the firebreathers (is that even a term anymore? Damn, I’m old) religiously drink shaker bottles full of Kool-Aid before their workouts. A myriad of DayGlo colors grace these bottles, electric blues and pinks, greens and reds so bright there is no chance a naturally occurring flavor corresponds to their brilliant hue. Quietly you glance inside the cavernous depths of a King Kong bag and see a plastic tub labeled NUCLEAR GARBAGE (yes, this exists) and it’s just all too much. You tap the bag’s owner on the shoulder and he turns his crazed eyes on you, covered in a fine sheen of sweat despite having spent the last 10 minutes foam rolling. “What is that stuff?” you ask, pointing to his shaker, filled with what looks like the ooze the Ninja Turtles crawled from. Not to be confused with a BCAA supplement (which is technically a pre/intra workout supp), true pre-workout generally contains at least four ingredients that aim to give you more energy, focus, pump, gains, erections, etc. during your workout. While different supps may contain other ingredients (arginine, taurine, etc.) the “Four Horsemen” (wooooo!) 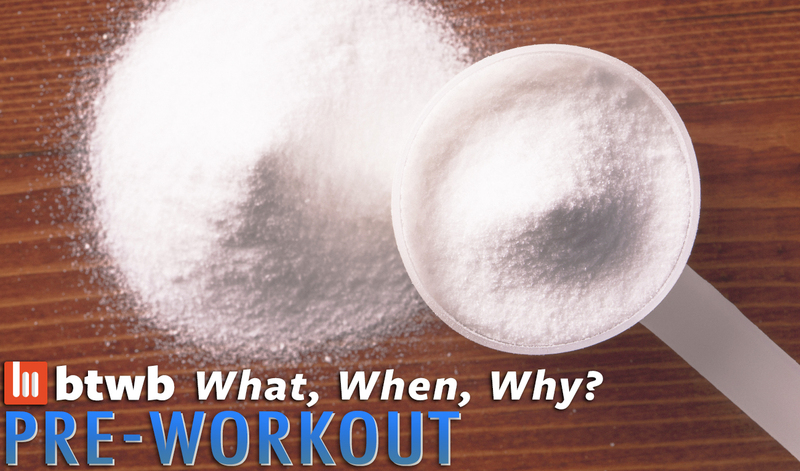 are: Creatine, Caffeine, Nitric Oxide, and Beta-Alanine. Creatine: Generally well-known and respected as a safe and useful supplement, is (put very simply) used in the production of ATP, which is basically MUSCLE ENERGY! Clinically proven to help in bouts of repetitive high intensity work, especially with brief rest periods (sound familiar), Creatine helps your muscles “recharge quicker” during a workout. Caffeine: Yup, same stuff that’s in coffee, green tea, or Jolt Cola (miss that stuff), caffeine is a Central Nervous System (CNS) stimulant and the world’s most widely consumed psychoactive drug. I won’t get toi science-y here, you know what caffeine is- it puts a little pep in your step, old salt! Beta-Alanine: Known for delivering that warm, tingly, itchy feeling that has CrossFitters looking like brawny Tyrone Biggums’, beta-alanine helps keep muscles in a balanced pH state that optimizes performance. Keep in mind that not all pre-workouts are created equal, and that you need to do your research before buying or consuming one. Jack3d, by USPLabs, is already infamous in CrossFit circles, as it contains a powerful and BANNED stimulant called DMAA. More frightening is that case of a pre-workout called Craze that contained a chemical very similar to methamphetamine. Do your homework, kids. This question is far more complicated, nuanced, and personal. Supplements in general represent an easy focus of energy, attention, and money in pursuit of the goal of getting better. Humans are tricky animals, and most of us would rather plop down fifty bucks for a tub of something that some guy at GNC told us would make us stronger than get an extra hour of sleep at night, spend an hour on meal prep on Sunday, or say no to a (third) margarita at brunch. What I always tell my athletes is that supplements are a privilege and should be reserved for those who are confident that their training, nutrition, recovery, and other lifestyle factors are already top notch. For those of you who insist on using pre-workouts, I’d encourage using it sparingly. Like most drugs, you build tolerance to many of the ingredients- I know people who need two, three, or more scoops of pre-workout, who dump scoops directly into their mouths, and it’s silly. Save it for days when you feel really flat, or have a ton of heavy lifts ahead, or really need a pick me up, and not before a ROMWOD sesh. So, scoop away amigos, but know your reasons for doing so. Pre-workout can be a valuable tool and get you through a tough training session or competition if you’re worn down and tired, but don’t get too comfy with that tingle in your dingle. Like most of the stuff we discuss in these WWW articles, nothing is a substitute for hard work, focusing on the little things, and treating your body with care and respect. When I check my Pre-Workout composition I realize that most of its ingredients are in the food I used to eat. Thx for that great text! Amazing informations! Great article, concise and hilarious. Thank you.